Safety is critical to the responsible delivery of energy. We develop and operate our facilities with the aim of preventing incidents that may harm our employees and contractors or nearby communities, or cause environmental impact. 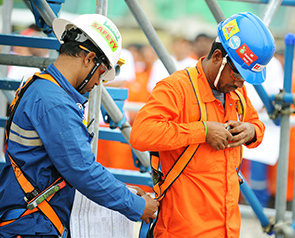 We continue to build a culture where each person understands their role in making Shell a safer place to work. We manage safety through rigorous processes and by embedding a safety culture in the daily lives of our workforce. Everyone working for us and joint ventures we operate must follow our safety rules, intervene in unsafe situations, and respect our neighbours and the environment. Our HSSE & SP Control Framework, a global set of standards and accountabilities, defines the operational controls and physical barriers we require to prevent incidents. Our Life-Saving Rules and annual Safety Days continue to improve risk awareness and foster a culture where everyone takes responsibility for safety. Road safety is one area where this approach has achieved good results in recent years. The Oil & Gas Producers Association (OGP) has drawn up a set of recommended safety rules for its members based on the Shell Life-Saving Rules. Our Safety Day is an important global event. Shell employees and contractors across the world come together in a number of locations – from deep-sea platforms and desert oil fields to refineries, chemical plants and offices – to improve their understanding of safety and reinvigorate their goal of staying safe.